For some reason, red flowers are big in Paris this year. I suspect they are big every year, but it's the red ones I've been noticing most. Assisi is big on red flowers, too. 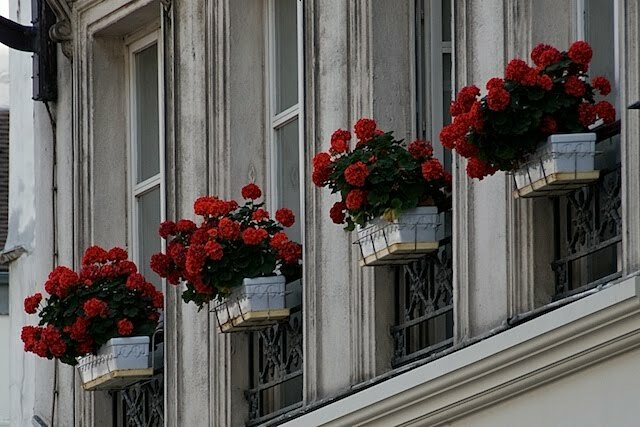 They look great repeated in window boxes like this. This is the sort of view I watch the TdF for. Oops ... I probably should not admit to that! The trouble with stumbling upon your travel photo blog and looking at them all at once, is that I am quickly running out of adjectives to comment! I just love most of the photos you take..and especially this one! Very Artistic!